For business professionals and students, the stylish HP 20b Business Consultant is easy to use and learn, with finance, business, and real estate functions at your fingertips. Get faster answers with the intuitive layout and high-speed processor, and view those big numbers on the large two-line display. 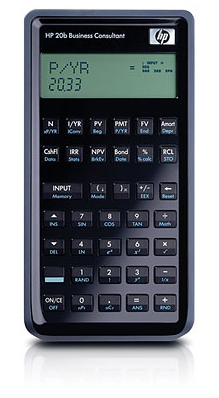 Choose your preferred entry method: time-saving RPN, familiar algebraic or traditional chain algebraic. Does not come with a case, but the casing is made such that when turned over, neither the keys nor display touch the table surface.